Jayapura, Jubi/Antara – Coordinating Minister for Political, Legal, and Security Affairs Tedjo Edhy Purdijatno remarked that Indonesian youths may launch a cyber attack on Australia in retaliation for the Tony Abbott government’s threat. “Some time ago, Australians hit Indonesia through a cyber attack. Now, Indonesian youths might retaliate in the same way,” Tedjo Edhy Purdijatno said while attending the 14th congress of the National Committee of Indonesian Youth (KNPI) here on Thursday (26/2/2015). He delivered his statement in front of a thousand Indonesian youths who were attending the congress in Papua. He was explaining the government’s stance on foreign pressure to cancel the death penalty. According to the minister, President Joko Widodo is committed to combating drug abuse and trafficking. The policy of death sentence for drug dealers is not negotiable. “The President is not going to pardon drug offences,” he added. Therefore, the Indonesian government is not afraid of threats related to the execution of foreign drug dealers. Australia, he noted, will issue four threats if the Indonesian government executes two Australian drug smugglers, Andrew Chan and Myuran Sukumaran. The four threats will be withdrawal of ambassadors, boycott of Indonesia’s tourism destinations, withdrawal of aid to Indonesia and its citizens overseas. Last week, while making a plea for two Australian drug traffickers on death row, Australia’s Prime Minister Tony Abbott mentioned the country’s relief aid to Indonesia following the 2004 tsunami disaster. “Abbott’s comments hurt Indonesia’s people,” he pointed out. In response to Abbott’s comments, a group of people in Jakarta collected coins to raise funds to symbolically return Australia’s financial aid for the tsunami disaster in Aceh in 2004. The move was in protest against Abbott reminding Indonesia about his country’s humanitarian aid while he was making a plea for the lives of Andrew Chan and Sukumaran. A similar action was launched by Muslim students in Aceh, saying they felt insulted by Abbott’s statement. Earlier, an academic from the University of Pelangka Raya, Central Kalimantan, Prof. Dr. HM Norsanie Darlan said the death penalty will serve as a deterrent. Drug abuse causes death; therefore, drug dealers deserve death,” Prof. Darlan noted here on Sunday night. “We hope that death sentence, in addition to serving as a deterrent, would be a lesson that will stop other people from smuggling drugs into the country,” he remarked. He stressed Indonesia should not be bothered by protests from other countries, such as Australia and Brazil, and even the United Nations Secretary-General. According to him, Australian Prime Minister Tony Abbott’s statement, which reminded Indonesia about its humanitarian aid while attempting to save two Australians from execution, reflected his frustration. “He (Abbott) is not aware that two of his people have caused much damage to the Indonesian people, mainly young boys and girls,” he pointed out. Earlier, the Indonesian government stated that drugs claimed at least 50 Indonesians daily. President Joko Widodo (Jokowi) has said he will turn down all clemency appeals from drug convicts. According to the government, the country is in a state of emergency and that it has the third largest number of drug addicts in the world and has become a major centre of international drug syndicates. The government’s decision to issue the harshest punishment to drug dealers has received wide support, including from religious organizations and parliament. The General chairman of the country’s largest non-political Islamic organization Nahdatul Ulama, Said Aqil Siradj, stated, “we should not waste time listening to protests from other countries.” “We should execute drug criminals to save our 240 million people,” Aqil added. A lawmaker from the Commission III, Asrukl Sani, observed that Abbott was capitalizing on the death sentence issue to prop up his declining popularity. The Attorney General’s Office is preparing to execute 8 drug convicts and three prisoners convicted of premeditated murders whose appeals for clemency have been turned down by the President. Besides Myuran Sukumaran and Andre Chan from Australia, the other convicts are from the Philippines, France, Ghana, Spain, Brazil, and Indonesia. The three convicts facing execution for premeditated murders are all Indonesians. lets hope that he explains just how much Australia has and still is donating to Indonesia in the way of financial and military aid, and that Australia will probably cease all this aid if they become childish and nasty. I’m truly shocked and disgusted with those cowardly Indonesian ‘soldiers’ regarding their inhumane treatment of West Papuans whom they have callously raped and murdered. Those graphic images of innocent victims being tortured and then inhumanely killed is totally uncivilized. The ongoing reign of terror enforced upon the ancestral people of West Papua is the most disgusting act of cowardice ever recorded in modern times. Those countless atrocities committed upon innocent West Papuan victims surely bears the mark of the devil! How can these MENTALLY SICK Indonesians inflict so much agony upon fellow humans? When I think of the ‘aid’ money that Australians donated to the tsunami relief in Indonesia it certainly makes me VOMIT knowing now what some Indonesians are capable of doing to other people. Since those disturbingly graphic images of Indonesian soldiers committing murder have become viral WORLD WIDE Indonesians are now the most despicable nation on the planet. Men and women are supposed to be equal. There is no equality however when this type of murderous action upon defenseless people is allowed to continue. From now on I will definitely boycott any product which is made in Indonesia. When the next natural disaster hits Indonesia I certainly hope that those inhumane Indonesian soldiers are the first to succumb. All human races are entitled to living a free life on our planet earth. The United Nations is a toothless tiger and should hang their heads in SHAME. So too should Australia for not defending the rights of the ancestral people of West Papua. Tonight I will say special prayers for the unfortunate victims of those inhumane Indonesians soldiers who have guilt-free murdered countless victims with their genocidal massacres of West Papuans. STAY STRONG WEST PAPUANS. The world is watching this mass SLAUGHTER unfold. Someone, somewhere will take notice and hopefully intervene to help prevent this murderous torture of innocent victims from happening. I am not sure what this article has to do with the West Papuan situation or why it has been included in these Media alerts but I would just like to give my opinion on this article. Tony Abbott has not made any threats against Indonesia. Mentioning the Tsunami was not the most sensitive or diplomatic thing to do and has probably been misinterpreted as a threat, but it was not intended as a threat – more of a plea – we helped you – please help us now. As for the other threats mentioned, I have not heard him make any of these and Mr Abbott has no control over where Australians take their holidays. So people can no longer feel confident that they will come to no harm provided they obey the law. True – Mr Abbott is getting a rough time in Parliament and the media but his concern over these men is genuine. I didn’t vote for him because I am more left wing and the LNP is a right wing party but I still repect him as the elected Prime Minister and don’t believe he would stoop so low as to use this issue for his own political ends – he is not so cynical or calculating. If he were he would not be in the political strife he is in. If anything his problem is a certain political ineptness. Like many Australians, he cares about these men because they have reformed, have already spent ten years in jail and should not receive the ultimate penalty on top of ten years of a life sentence already served – you can’t exactly give a partial death sentence to allow for time already served. We also have heard that Indonesia makes representations for clemency for its own citizens in overseas jails in similar circumstances so don’t understand why our government’s representations should be regarded as interference with Indonesian sovereignty. I understood that the Bali 9 were actually smuggling heroin from Bali to Australia – not into Bali as is suggested in the last paragraph. They were intercepted and arrested attempting to leave Bali for Australia due to a tip-off from the Australian federal Police. Is there any evidence for them having smuggled drugs to Indonesia or having harmed any Indonesians – if there is it has never been mentioned in the press. It is their fellow Australians who would potentially have been harmed by their crime. The issue seems to have been turned into an “Indonesia versus the West” squabble with the lives of these unfortunates as the pawns in the game. They are just two rehabilitated drug smugglers who have done a lot to help other prisoners, including Indonesians, over their ten years in jail in spite of the uncertainty of their own fates which must have always been on their minds. Most Australians oppose the death penalty but, had these men been executed when first found guilty, most would have thought it was unfortunate for them and their families, but they knew the penalty. These men have since matured – ten years is a long time – and they are making reparation by living good lives in prison. We feel that the death penalty is too harsh in these circumstances when they are repentant and unlikely ever to re-offend. I don’t think people should be executed ever, but I would probably not waste my time speaking up for an unrepentant killer. It will be very wrong if these young men are executed simply to avoid political embarassment for President Joko Widodo or to thumb the nose at Tony Abbott or Australians in general. The best way to stop drug use is education – harsh penalties do not seem to have worked anywhere. Australians are often accused of racism and there would be a percentage who are but you may have noticed that neither of these two men whose lives we are pleading for is of European descent. As human rights journalists we too oppose the death penalty, be it extrajudicially on West Papuans from these Indonesian terrorists in uniform for merely engaging in peaceful non-criminal free expression, or on rehabilitated criminal prisoners who have repaid their debts to society. 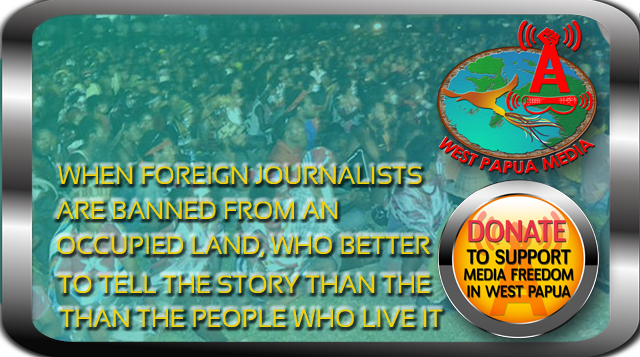 We are also fully aware of the back story, and West Papuans have also spoken out against this stupid sentence. So please put your criticism to the Indonesian government and nationalist media, and the gutless regime of Tony Abbot who is still selling weapons to kill Papuans and using the AFP to train Densus 88 political death squads. Thankyou for educating me. I know a little of the bad situation in West Papua and realise that innocent people are being illegally killed. It is wrong that the media focusses so much on one story and does not give equal prominence to all injustices: the nature of media unfortunately. I admit I am not as well informed as I should be about world affairs in general. I am a retired woman of no particular status but I would like to see a just and peaceful world. It seems to me that so called Democracy has become degraded in that Corporations are calling all the shots and that elected governments are doing as they are told by powerful economic forces and attempting to justify it to the populace as economic growth. At this stage I feel free to say as I please without fearing a knock on the door but I am also aware enough of history to know that this freedom can quickly change. I strongly hope that your country will gain its independence or at least a much greater degree of self determination. .